A beautiful 8000 square foot home sits in a serene setting in South Langley, surrounded by stunning homes in the High Point Equestrian Estate Community. With equestrian centres, large acreages and more, the area is a mecca of decor trends for the city dwellers who have a chance to see it or those lucky enough to live here. This is where the latest Millionaire Lottery home is situated. Anyone lucky enough to win the home will also be receiving the beautiful furniture inside. 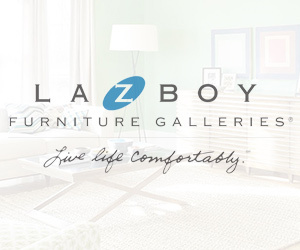 Debbie Heal, merchandiser at La-Z-Boy of Vancouver, is the interior designer of the home. Over the years, the company has furnished 20 homes for the lottery using their iconic furniture throughout. “French manor homes have a lot of comfort to them and casual elegance you could say. That was the main inspiration.” The house was mainly accented with navy colours, which Debbie says is a hot colour right now. Navy and tan is the theme for the living space of the home. The new decor trend right now is using pastels as part of the decor. In this master bedroom, lilac is the hot colour. Unlike the last lottery home, where Debbie used the surroundings of the equestrian community to inspire her, it was the simple elegance of this French Manor home that helped to begin the design process. Debbie was inspired to keep the furniture along the same lines. “The front of the house has a lot of fret work on it. So, the back of the chairs has a lot of fret work and the master bedroom has a lot of fret work too,” says Debbie. Debbie hopes visitors feel like they are at home when they enter this house. “I hope they get a sense of casualness when they enter the house. I want them to feel ‘homey’ in a large home. The home is open to visitors daily from 11am to 5pm in South Langley. For more information please visit the Millionaire Lottery’s website. The Millionaire Lottery helps Vancouver General and UBC Hospital buy the latest equipment to help doctors and nurses and fund lifesaving research for advances in medical care.